The Internet is the world’s largest shopping mall, library, video store, post office and town square. When you turn on your computer, you’re in the driver’s seat, choosing what you want to read, watch, and hear. We owe everything we love about the Web to net neutrality, the principle that the Internet is an open platform and service providers like AT&T, Comcast, and Time Warner can’t dictate where you go and what you do online. In 2010, the Federal Communications Commission tried to establish concrete rules to protect net neutrality. But the agency ended up caving to pressure from the biggest phone and cable companies and left huge loopholes standing in the way of a truly open Internet. And now Verizon is in court challenging those rules — and the FCC’s authority to draft and enforce them to protect consumers and promote competition. That’s because under the Bush administration, the FCC decided to give away much of its authority to oversee our broadband networks. The current FCC could fix the problem by reclaiming this authority, but it hasn’t yet. If the FCC loses the case and fails to take the necessary action to reverse course, the agency will be toothless as the biggest Internet providers run amok and destroy everything we love about the Internet. Indeed, the second it looks like the FCC is going to be defeated, you can expect all the telecoms and ISPs to join hands and declare they’ve reached an agreement to self-regulate. If this happens, they’ll win and we’ll lose. Online privacy will be a thing of the past. (If you thought it already was, believe me, things could get worse.) The ISPs will try to read all of your content so they can sell you to advertisers. New “troll tolls” will force content creators and others to pay discriminatory fees just to reach people online — and will require the rest of us to pony up for “premium” content. Does that sound Orwellian? That’s because it is. But this is no far-fetched scenario. 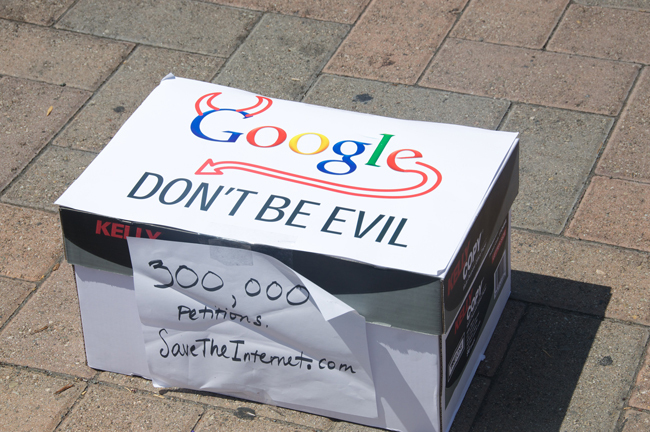 It’s time for us to stand up and fight for our online rights. We need to tell the FCC to stop messing around. It’s time for the agency to fix its past mistakes — and establish strong net neutrality protections that are 100 percent loophole-free. Jenn Topper is the media manager at Free Press, an organization fighting for your rights to connect and communicate. We’re in deep trouble if the ISP’s take control. Let’s all stick together and fight this power grab.